Under the Oak Tree: Who is Susan? And how did she get a blackeye? I cannot say with certainty that this is the first of our black-eyed Susan to bloom, but it is one of the first. On Sunday we received almost a half-inch of much needed rain which must have provided the catalyst for the plants flower. On my Monday morning commute, this lovely sight greeted me. 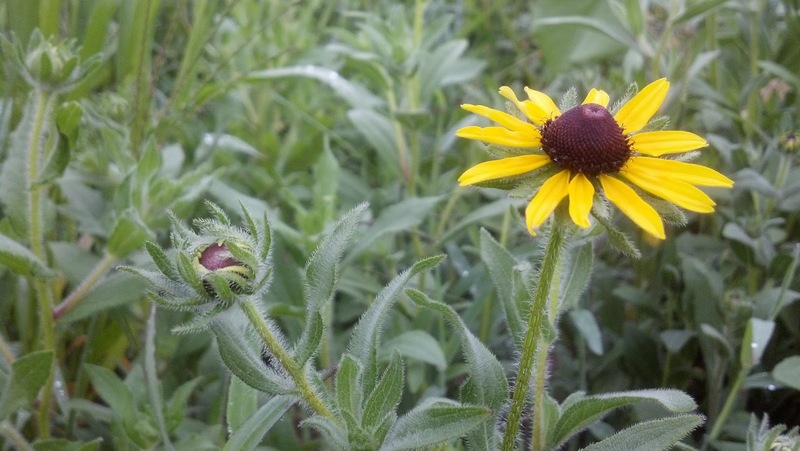 The overall status of the black-eyed Susan (Rudbeckia hirta) field is promising. The first three weeks after the seeding, Arington Tree Farm like much of Wisconsin, had an abundance of rain. I have continued to mow a perimeter around the planting to prevent Canada thistle from going to seed and infiltrating the field. However, we do have two weeds in the field: common lambsquarter and pigweed. Agrecol will soon be spraying Prowl, a water-based herbicide, to control these weeds. Stay tuned, I will post more photos of the field once more black-eyed Susan bloom and keep you updated on the cup plants.